It may be quiet but make no mistake, there is a war going on. Each side has the same rallying cry — “the client’s best interest” — but each side sees that cause differently. 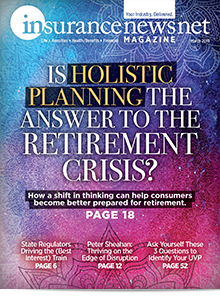 At stake is the future of not only the life insurance industry but also how the largest demographic groups of Americans enter their graying years. 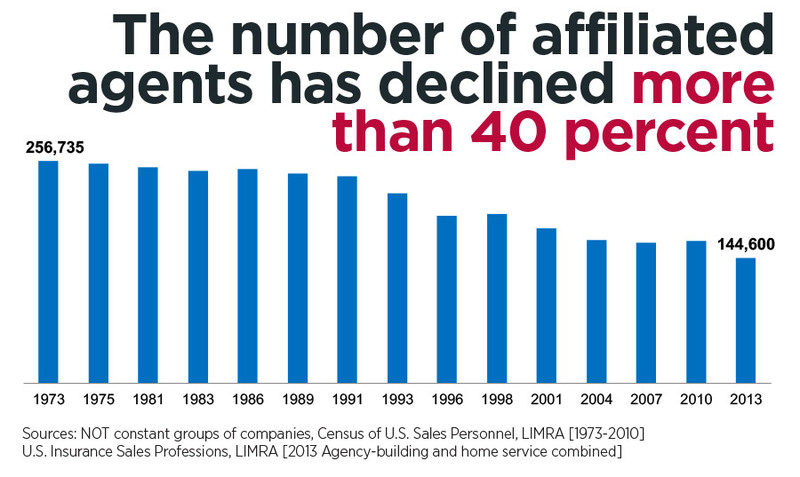 The population of independent life insurance agents has been thinning for decades, mostly because of an aging sales force that is no longer being replenished by life insurance companies or agencies. Insurers got out of the training business long ago, tired of spending resources only to see their most successful agents go independent. 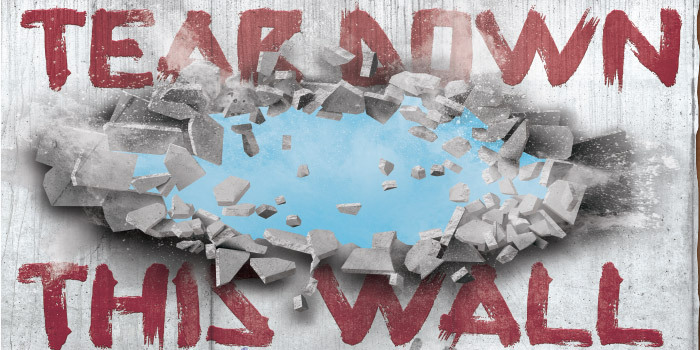 The threat of regulation to change the basic rules of sales has helped drain the pool of agents even further in recent years. The Securities and Exchange Commission tried to make fixed indexed annuities securities products with Rule 151A in 2010. Then the Department of Labor tried to throw a fiduciary umbrella over annuity transactions involving individual retirement account money. 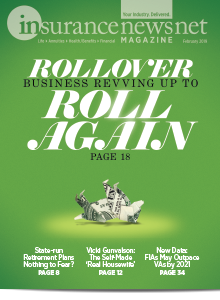 The regulatory rumbles continue with the SEC revisiting the fiduciary model while the National Association of Insurance Commissioners also looks at toughening the suitability standard. Most of these examples involve annuities, but the message is clear: The fee-based world is pressuring the commission-based sales tradition. Some agents are changing their business model to be more holistic in their approach. But many older insurance agents found they preferred retiring rather than overhauling their practices. Others have migrated to the world of financial advising, where more and more insurance companies see their future. Here’s the thing — financial advisors are not completely crazy about insurance. Even some former insurance agents are reluctant to recommend insurance products. Ashley Foster of Nxt:Gen Financial Planning in Houston started in the insurance business before becoming a fee-only advisor. Although he worked for 10 years in the business, he rarely recommends permanent insurance. Even with new fee-based products being developed, he is still skeptical. He was especially critical of the increased cost of insurance in some older universal life policies, making them unaffordable for some clients. He did not spare the old insurance standby, whole life. “Since dividends are not guaranteed and have been in long-term decline, recommending a product that is sold on the strength of nonguaranteed participating dividends is difficult for fee-only planners,” Foster said. Although Foster represents the opinion of a hardened base of advisor resistance to insurance, many financial planners see recommending coverage as part of their fiduciary duty. John Chan, a partner at Alamo Insurance and Wealth Management, San Antonio, said insurance is essential to holistic planning. Not only does he see this need in his clients, but he is seeing the effect of under-insurance all around him. How things got so complex is complicated. In the early 1980s, policy count for individual life insurance peaked. This was the end of the door-to-door, home service era. That era was when cold-calling often meant a knock on the door to sell small-face term or whole life policies. Premium was often collected weekly or every other week at the same door by a debit agent. If clients wanted more coverage, they would buy more policies. Any overall market growth corresponded with an increase in policy count. Companies focused on increasing premium per policy and decreasing the labor-intensive home service model. As they went upmarket, the companies required fewer field career agents. Another major factor in the drop in individual policies was the rise in group coverage during the 1970s and ’80s. As more people were covered at work and remained at companies long term, they often felt little need for additional coverage. Certainly, many agents would argue that those workers should have had their own coverage secured in their younger, more insurable years — coverage they could keep regardless of employer. Overall group coverage dropped after the 2008 economic crash and has stalled ever since. But perhaps the most significant change since the early ’80s was the arrival of universal life. UL is flexible, so clients could increase or decrease coverage without having to buy a new policy — and not adding to overall policy count. The products boomed in popularity. They were seen as an alternative to whole life — viewed as opaque, inflexible and expensive. In a sense, UL was an independent agent’s whole life, which was usually sold by mutual companies. UL was more transparent, showing the accounts within the product. But they weren’t simple. Whole life might have been accused of being a “black box,” but it was simple in the sense that clients knew what they would pay and what they would get. Riders could also be attached to existing UL policies, which also did not add to policy count. 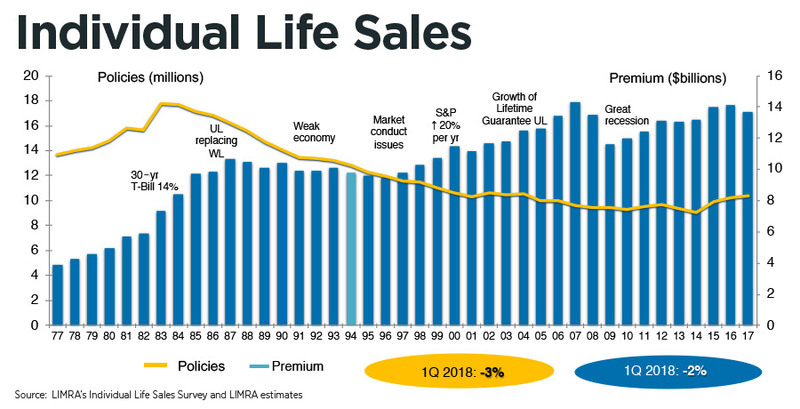 The growth in UL sales corresponded with an increase in overall premium. So a smaller percentage of the population was being covered but paying a higher premium. 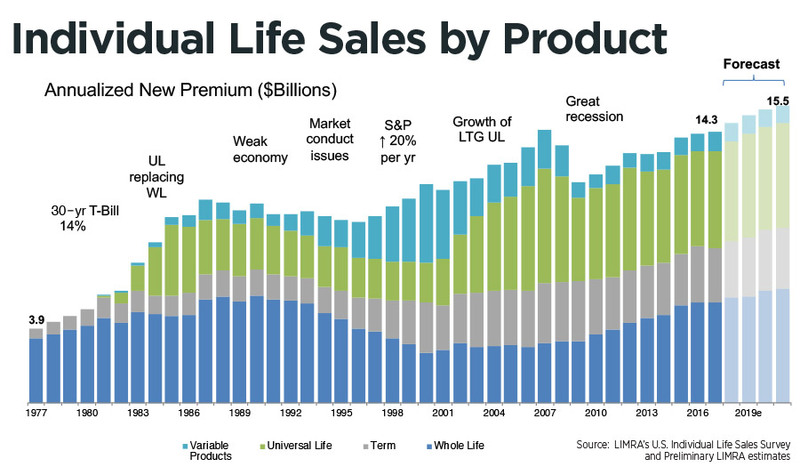 Variable UL started growing in the late ’80s and roared with the stock market into the ’90s. VUL met the same fate as equities in 2000, with sales plummeting with the Dow Jones average. 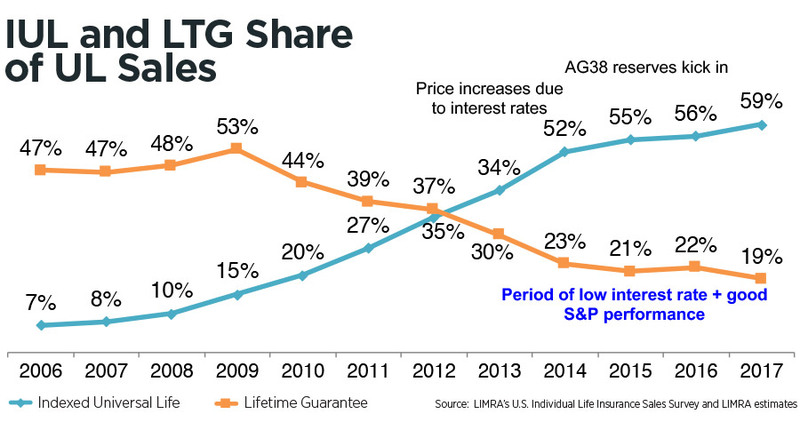 Agents had switched to lifetime guarantee UL, or simply guaranteed UL, after the 2000 crash. But that also dropped after the 2008 crash. After the crash, indexed products took off because of their combination of the inherent safety of the underlying annuity or UL and the possibility of gain with the indexed account. But fixed indexed annuities were assailed, first by the SEC, which tried to regulate them. Then the Department of Labor tried to restrict the sale of FIAs bought with IRA funds. During this time, indexed UL boomed as other UL faded. Whole life also bounced back after the crash. Now IUL and whole life are the leading lights of the fixed life insurance market. Another rising star has been withdrawal riders, particularly ones targeting long-term care needs. LTC insurance has not been selling well for several years, despite consumers’ anxiety about their lengthening longevity. Rather than dying early, Americans are facing the risk of needing some kind of long-term assistance in their later years. LTC riders answer the two objections of an insurance product. Consumers often balk at putting money into a product they suspect they or their heirs might never use. They resist LTCi because of cost and the history of carriers changing pricing and conditions on existing policies. Those products are helping insurance agents, but the independent field force is still shrinking. More have been retiring or just leaving the business, pushed along by threats of regulatory changes, and they are not being replenished. Over on the financial advising side of the fence, RIAs were rallying, fiduciary flag in hand. Could insurance companies make inroads into that world? 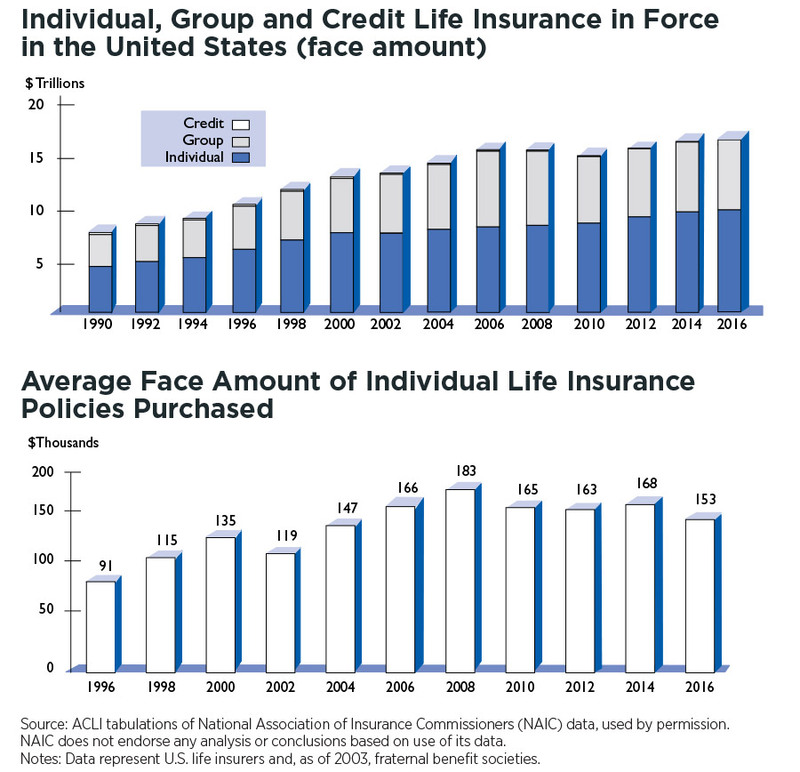 The life insurance industry has regained its footing since the 2008 crisis, but it is still not back to the precrash peak of 2007. Robert Kerzner, CEO of LIMRA, said he is not satisfied with where the numbers are. But he pointed out that the 2007 spike coincided with a surge in stranger-owned life insurance, which the industry identified as a scourge at that time. Current policy count nationally is equal to the count just before the peak. 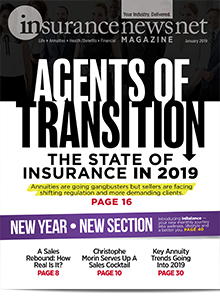 The insurance world has been recalibrating to adapt to a shifting American demographic, particularly the part that has the money to spend on insurance products. Policy count has ticked up since an all-time low point in 2013. Kerzner saw that as encouraging, but said the types and purpose of insurance have changed dramatically since the heyday of 40 years ago, when he first got into the insurance business. 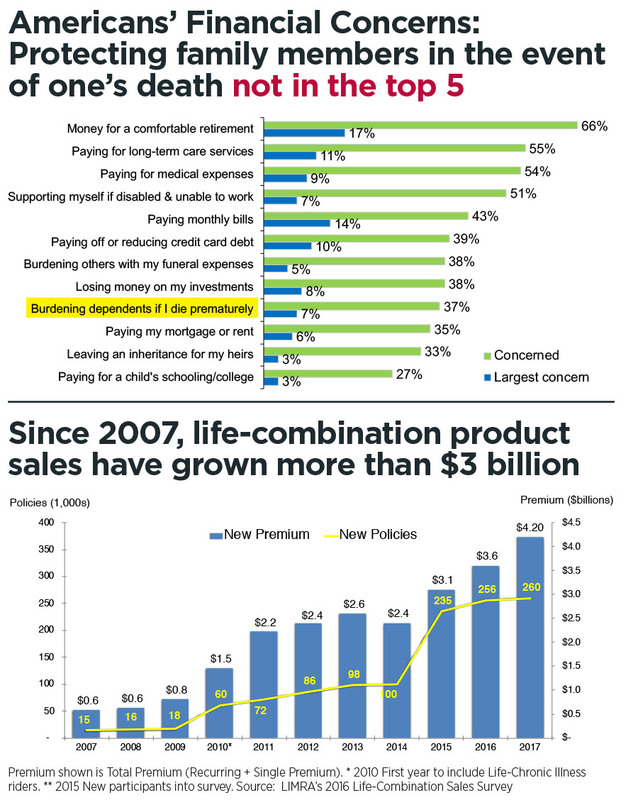 Nevertheless, it is clearly challenging to sell life insurance products other than annuities. The demographics are not in the sweet spot, and the traditional sales force is shifting. Kerzner has seen a large chunk of the agent force move to be more diversified and include asset management. If they sell any life products, they tend to be annuities. He has seen that migration go to two areas over the past 20 years: bank platforms and broker-dealers. Kerzner will be retiring at the end of this year after 14 years with LIMRA. Before then, he was with Hartford Life for 30 years, having risen to executive vice president and head of the individual life division. In that time, he has not only seen the shift from insurance agent to financial advisor, but he has also heard the arguments advisors make against life insurance — too complex, too front-loaded with compensation. He said he understands the reasoning but still does not buy the arguments. But, even so, advisors would still feel the stigma of being paid up front. Because of that, products should be built for the way fee-based advisors do business. Kerzner is still skeptical that those products would make an enormous difference because he is not seeing advisors recognize the intrinsic value of life insurance. Another argument against insurance products is complexity and opacity, a charge usually leveled at annuities. But permanent life insurance, particularly whole life, is a target for this criticism. In fact, that accusation was one of the motivations for creating universal life, which bares its inner workings. Kerzner is not completely swayed by the complexity and transparency argument either. 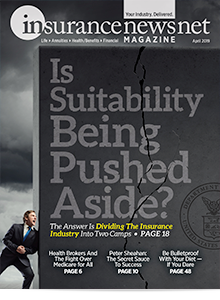 The industry is responding by crafting fee-based insurance products to appeal to advisors. Carriers are shaving corners off the square pegs, but the products still don’t always fit neatly into the round holes. For example, how should an advisor charge a fee? Should the product be considered an asset under management, even though it is not an asset that needs much management? And where does the fee come from? That is a problem that Terrence Herr of Herr Capital Management in Chicago grapples with. Fee-based products tend not to have all the bells and whistles of commissioned ones, particularly UL, but some of those features are missed. However, Herr said he is encouraged by changes he is seeing with newer fee-based products, where many of the same features or new ones are being offered. There is still the issue of charging fees though, especially on annuities. Another route is charging a fee for time. Clients usually are not eager to write a check for service, but Herr said that is changing. Many of his clients are coming from large brokerage houses that were pushing investments rather than doing a holistic financial plan, which he believes must include life insurance. David Lau is one of those trying to build the bridge between RIAs and insurance products. His firm, DPL Financial Partners in Louisville, is not an insurance company, insurance marketing organization or RIA. It is an insurance agency working with about 20 insurers. Lau set up the agency four years ago after nearly 10 years with Jefferson National, where he was the chief operations officer. He helped Jefferson build variable annuity distribution for RIA clients. His experience showed him that insurance companies and RIAs seem to be speaking past each other. Commission was the biggest problem in the fee-based world, particularly with fee-only advisors. So he saw that advisors were excluding insurance, which he considered key to a complete financial plan. But it was more than just the product. Lau’s agency’s unusual setup is that RIAs pay to be a member of it. DPL then sells fee-free and commission-free insurance to the RIAs’ clients. Insurance companies pay the agency to sell the product. DPL is advising some of the 20 companies it works with, not necessarily selling their products. The agency is helping some companies work with RIAs. Companies are building special products and trying to cater to fee-based financial advisors. What more do advisors want? Like partners in any relationship, they would like to be spoken to on their terms and in their comfort zone. A key concern is how product performance is presented. Illustrations help clients understand how products are projected to perform for decades out. The models became popular as universal life grew. Agents would use illustrations to show premiums that often ended up being insufficient because of inaccurate assumptions in the models. Quite a few academic studies have found a high failure rate for those scenarios. In fact, InsuranceNewsNet Magazine published an award-winning article written by Richard Weber in July 2013 that showed that 15 years since industry reform, companies and agents were still using inaccurate models. His research showed a failure rate of more than 90 percent of commonly used illustrations. Barry D. Flagg of Triangulum Financial in Tampa said he has spent more than 30 years in life insurance and is now a sub-advisor for thousands of life insurance trusts and for RIAs, CPAs and tax attorneys. He said he finds those dubious projections are the biggest hurdles to acceptance by those professionals. They are useful to “salespeople” but are “inconsistent” with the advisors’ duty to exercise reasonable care, skill and caution, he said, adding that this issue eclipses the commission vs. fee argument. 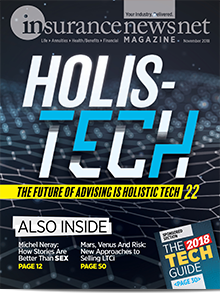 “Until insurers and marketing organizations provide advisors with reliable cost and performance information needed to actually make a recommendation in the clients’ best interest, and do so in ways that are consistent with the advisors’ way of doing business, financial advisors will continue to be reluctant to recommend life insurance without regard to the form of compensation,” Flagg said. Insurance companies have said that they are being transparent in their products and the information is available to advisors. Herr of Herr Financial in Chicago said advisors have to know where to look. But Herr is not leaving it just in advisors’ laps. Insurers have to break it down in the ways advisors want it. When Herr started in insurance more than 20 years ago, he sat with agency managers who explained the products. But an advisor starting with a broker-dealer is unlikely to get the same instruction. 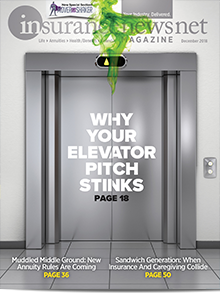 If companies want to reach a new audience, they will have to go to new places, Herr said. But Herr did not let his fellow advisors off the hook. If they are going to consider themselves holistic, best-interest advisors, they need to change their metrics.